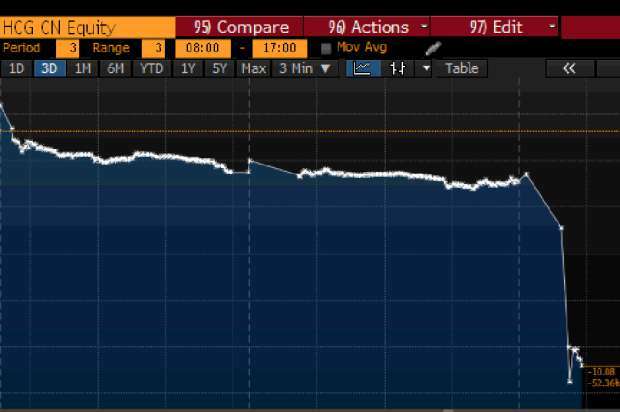 Shares of beleaguered mortgage lender Home Capital Group Inc. plunged 65 per cent on Wednesday as the company revealed it was negotiating an emergency $2-billion line of credit to shore up its finances after depositors rushed to pull money from their savings accounts. The news shook Bay Street as analysts raised concerns about the company’s viability if investors continue to withdraw more funds from their accounts at Home Capital’s wholly owned financial subsidiary, Home Trust. Home Capital is Canada’s largest alternative mortgage lender, providing subprime loans to people who don’t qualify for traditional bank mortgages. The company relies on deposits to provide the money to make loans. Its financial struggles, which stem in part from a regulatory investigation in Ontario, underscore the pressure that is building in parts of the housing market. Home Capital is one of a number of lenders that provide a path to home ownership for people who would otherwise find it hard to borrow money for a house. But at the same time, the company has come under scrutiny for what some critics say are lax lending practices that have added fuel to real estate prices. Laurentian Bank analyst Marc Charbin said the announcement of withdrawals suggests deposit brokers “are losing faith” in Home Capital. “Worst case, this could cause a run on the bank,” he warned in a statement to clients Wednesday. However, Home Capital said it is well capitalized. The company said the expected new line of credit, combined with Home Trust’s current available liquidity, would give it access to more than $3.5-billion in total funding, which is more than twice the amount of the balances in the high-interest savings accounts. “Access to these funds is intended to mitigate the impact of a decline in Home Trust’s [high-interest savings account] deposit balances that has occurred over the past four weeks and that has accelerated since April 20,” it said. Home Capital revealed Wednesday that depositors have withdrawn $591-million since March from their high-interest savings accounts, leaving a remaining balance of $1.4-billion. “The company anticipates that further declines will occur, and that the credit line would also mitigate the impact of those,” it said. Despite the drop in savings deposits, Home Capital said balances of its guaranteed investment certificates (GICs) have remained “essentially unchanged.” As of Dec. 31, 84 per cent of Home Trust’s deposits were GICs and other products payable on fixed dates, and 16 per cent were demand deposits such as savings accounts. “Unlike the decline in high-interest savings [which depositors can withdraw at any time], Home Trust’s GIC deposits mature over time and have remained stable in recent weeks,” Home Capital chairman Kevin Smith said in an e-mailed statement. Mike Rizvanovic, analyst with Veritas Investment Research, said the biggest fear is a possible run on the GICs. As the financial crisis of 2008 and 2009 demonstrated, financial-services companies are built on investor confidence. If confidence starts to slip, panic can quickly take over and cause stock prices to plummet in the blink of an eye. Over the past week, fears have grown that potentially put Home Capital’s business model in jeopardy. Home Capital’s financial problems have been growing since March, when it revealed the Ontario Securities Commission was investigating the company’s disclosures to investors. The company fired its chief executive officer shortly after. Its troubles escalated last week when the OSC unveiled a series of allegations, accusing the company of making “materially misleading statements” to investors. The regulator also named a number of current and former executives in its allegations. Earlier this week, more impending top-level departures were announced, including the planned exit of its chief financial officer early next month. But the most immediate problem for Home Capital has been a growing lack of support from other financial institutions, who steer clients into Home Trust’s high-interest savings products. Roughly 70 per cent of Home Trust’s total deposits are GICs placed by third-party brokers. Without those deposits, the company can’t adequately fund itself – barring a massive bailout. Investors have interpreted the banks’ caution as a lack of confidence in Home Trust’s stability, and have liquidated Home Capital’s shares, driving them down to their lowest level since September, 2003. Home Capital’s market value fell from $1.1-billion Tuesday to just $384.6-million. Mr. Charbin of Laurentian Bank said the GIC deposits may be vulnerable. GICs have fixed terms and there are penalties for early withdrawals, so investors have less flexibility to move them quickly. But they could “follow the same trajectory” as the high-interest savings deposits when they are renewable, he said. Home Capital’s new borrowing has not come cheap. It said the new credit line under negotiation would carry a 10-per-cent rate of interest on the first $1-billion borrowed, and 2.5 per cent on the remainder. The company will also pay a $100-million “commitment” fee, which is non-refundable. Mr. Gloyn said that if Home Capital’s planned funding materializes, it would be paying an effective interest rate of 22.5 per cent on its first $1-billion of borrowing, or 15 per cent if the company uses the full $2-billion facility. He said that could drive down 2017 profit per share by 20 to 40 per cent. 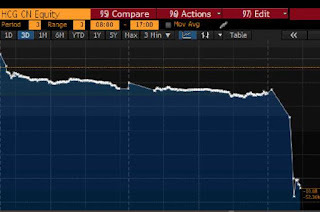 Shares of Home Capital Group Inc. plunged 65 per cent Wednesday after the embattled mortgage lender said it was seeking a $2 billion line of credit to backstop a significant decline in deposits at its subsidiary. Home Trust has seen deposits drop by nearly $600 million in recent weeks and Home Capital said that it expects the withdrawals to accelerate. Analysts suggested the loan could come with an effective interest rate as high as 22.5 per cent on the first $1 billion. Home Capital said the non-binding agreement in principle would be secured against a portfolio of mortgages originated by Home Trust. “Access to these funds is intended to mitigate the impact of a decline in Home Trust’s HISA (high interest savings account) deposit balances that has occurred over the past four weeks and that has accelerated since April 20…. The Company anticipates that further declines will occur, and that the credit line would also mitigate the impact of those,” the company said. Home Capital added that it expected a “firm commitment” for the loan facility on Wednesday. The development comes just days after Home Capital announced an executive and board shuffle in an effort to reassure investors after the Ontario Securities Commission accused the mortgage lender of misleading disclosure. The allegations relate to Home Capital’s disclosure following the discovery that some loan applications contained falsified income information, after which the company cut ties with dozens of brokers in 2014. On April 19, the securities regulator filed a statement of allegations and notice of hearing against the company; founder and former chief executive Gerald Soloway; chief financial officer Robert Morton; and former president and chief executive Martin Reid. None of the allegations have been proven, and Home Capital’s chairman of the board Kevin Smith has said the company will “continue to vigorously defend our approach to disclosure” in the OSC proceeding, to be held May 4. Home Capital announced on Monday that Soloway would retire from the board of directors as soon as a suitable replacement is found, but run for re-election at its annual general meeting next month. Morton is set to step aside after the company’s first quarter results are filed next month, and will be assigned new responsibilities outside the financial reporting group. Reid was terminated from his role as CEO of Home Capital in March. These demand deposits, as well as fixed deposits such as Home Trust’s Guaranteed Investment Certificate (GIC) deposits, help fund Home Capital’s mortgage lending. High interest savings account balances at Home Trust have fallen by $591 million in the period from March 28 to April 24 to $1.4 billion, Home Capital said Wednesday. Jaeme Gloyn, an analyst with National Bank of Canada Financial Markets, said Home Capital’s announcement could “spur other investors and deposit agents to continue redeeming high interest savings accounts and or demand deposits. “This represents $2.5 billion, or 16 per cent of HCG’s total deposit funding structure. 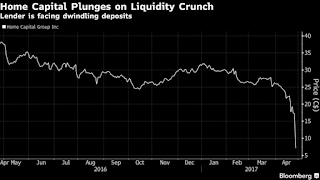 This will further impact margin pressure as HCG uses more of the expensive credit line,” he said in a note to clients on Wednesday. The loan facility, combined with Home Trust’s current available liquidity, would give Home Trust access to more than $3.5 billion in total funding, more than twice the amount of outstanding high interest saving account balances, the company said. As part of the agreement, Home Trust would be required to pay a non-refundable commitment fee of $100 million and make an initial draw of $1 billion. The interest rate on outstanding balances would be 10 per cent, and the standby fee on undrawn funds would be 2.5 per cent, Home Capital added. Gloyn said this translates to an effective interest rate of 22.5 per cent on the first $1 billion, declining to 15 per cent if fully utilized. Home Capital has already seen reputational risk in the wake of the OSC allegations result in liquidity issues. Last Friday, the Bank of Nova Scotia briefly stopped offering Home Trust’s broker GICs — a major source of the mortgage lender’s non-securitized funding. Home Capital said that Scotiabank intended to resume sales of its broker GICs on Monday, but it and other leading financial institutions instituted a $100,000 per client cap (the upper limit for coverage by Canada Deposit Insurance Corp. insurance). Home Trust GICs and high interest savings accounts deposits are eligible for CDIC insurance. Home Capital said Wednesday its GIC deposits remained essentially unchanged between March 28 and April 24, when it stood at $13.01 billion. Demand deposits represent roughly 13 per cent of their funding, but these GIC deposits represent roughly 71 per cent, said Mike Rizvanovic, an analyst with Veritas Investment Research in Toronto. “That’s the last shoe to drop. If that starts to go, then they don’t have a viable business structure any more. They can’t exist … that’s the last unknown,” he said in an interview. This won’t be apparent for a few weeks as the holders of those GICs are unlikely to cash those in before they mature due to the built-in penalty, Rizvanovic added. Of Home Capital’s total GICs, 52 per cent mature in less than a year, and 36 per cent are due to mature between one and three years, he noted. “This is a very peculiar situation where Home Capital has no issues around credit, and no issues with a capital shortfall. Yet they are being decimated in terms of their viability as an ongoing entity,” Rizvanovic said. Home Capital shares closed at $6 in Toronto, Wednesday, down 64.89 per cent from Tuesday’s close of $17.09. Shares of other non-bank mortgage lenders were also hit Wednesday — with Equitable Group shares down 31.65 per cent to $40.75 and Genworth MI Canada shares down 7.87 per cent to $33.12 — amid investor concern about the alternative mortgage lending model and recent moves by both the federal and provincial governments to cool down the overheated housing market, particularly in Vancouver and Toronto, analysts say. 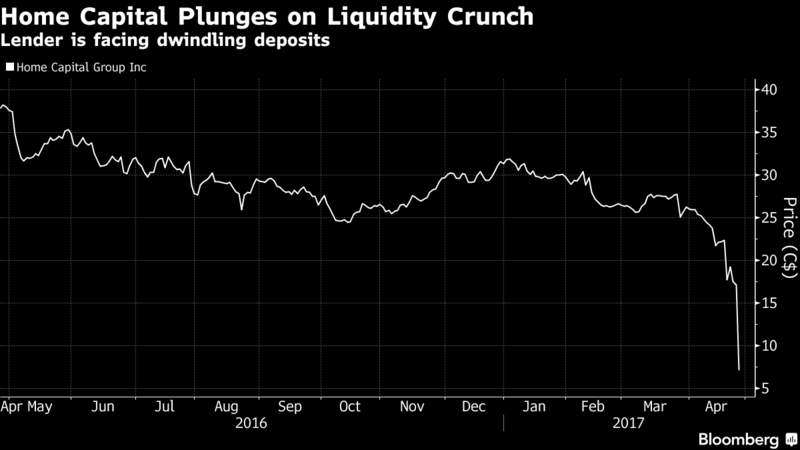 Home Capital Group Inc.'s shares plunged more than 60 percent after the mortgage lender disclosed a costly new loan to tide it over as its deposits dwindle, intensifying a spiral of bad news for the company. The C$2 billion ($1.5 billion) loan is coming from an institutional investor that Home Capital did not identify, and the lender’s agreement is non-binding. With a 10 percent interest rate plus other fees and charges, the company is effectively paying 22.5 percent on the first C$1 billion it borrows, which falls to 15 percent if it uses the full C$2 billion available to it, according to Jaeme Gloyn, an analyst at National Bank of Canada. Ontario’s securities regulator last week accused the company of misleading investors and breaking securities laws. 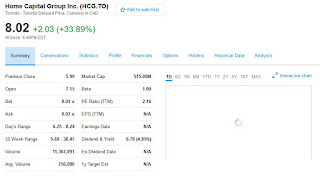 On Wednesday, Home Capital shares dropped as much as 64 percent in Toronto to C$6.11, their lowest since 2003 after their biggest ever one-day drop. 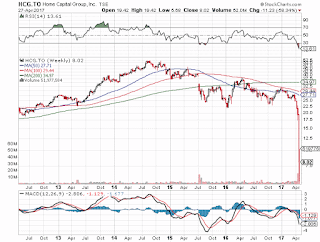 Other home lenders’ shares declined as well, with Equitable Group Inc. falling 32 percent, Street Capital Group Inc. down 7.5 percent, and First National Financial Corp., 8.5 percent. Home Capital’s troubles come as housing prices have jumped in Canada. In Toronto, home affordability reached its worst level since 1990 at the end of 2016, according to a report from Royal Bank of Canada. The credit line will be secured by a group of mortgage loans made by Home Trust, the Toronto-based firm said in a statement Wednesday. Home Capital expects a firm deal later the same day. Home Capital’s external spokesman Boyd Erman declined to comment beyond the statement. Canada’s banking regulator is “monitoring the situation closely” but isn’t allowed to disclose details of any supervision, Annik Faucher, spokeswoman for the Office of the Superintendent of Financial Institutions, said in an emailed statement. Home Capital Founder Gerald Soloway will step down from the board when a replacement is named and Robert Blowes will assume the role of interim chief financial officer, the company said Monday. The new loan will provide Home Capital with more than C$3.5 billion in total funding, more than twice the C$1.5 billion in liquid assets it held as at April 24. It also has C$200 million in securities available for sale; high interest savings account balances were at around C$1.4 billion, after having fallen C$591 million from March 28 to April 24. Lenders such as Home Capital rely on deposits to help fund their mortgage loans. 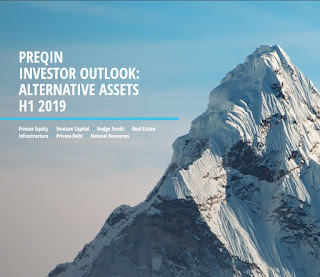 “The company anticipates that further declines will occur, and that the credit line would also mitigate the impact of those,” Home Capital said. [...] my recent comment on Canada's real estate mania has proven to be extremely popular. I'm increasingly concerned about Canada's $1.1 trillion shadow banking system which is now half as large as banks, and you can see the dominoes are beginning to fall as Home Capital (HMC.TO) melted down yesterday on the stock market the same day Ontario was trying to hammer housing (read Garth Turner's latest, Cold Comfort). Still, Home Capital's stock is bouncing up today (wouldn't touch it with a ten-foot pole!) and I was surprised to see the Royal Bank is the latest Canadian firm to explore a sale of bonds backed by uninsured residential mortgages after that bank's CEO warned of a frothy Canadian housing market. Also, Ted Carmichael discusses Toronto's real estate boom, stating that while some say that house prices will never decline, the city's history clearly demonstrates that there is a good chance that, like its two predecessors, this boom will end badly. To my former BCA Research colleague, Steve Poloz, who is now the Governor of the Bank of Canada, all I have to say is "be very afraid of Canada's housing bubble." Now that shareholders have been destroyed, what will happen to those people invested in Home Trust's GICS? As stated in one of the articles above, Home Trust GICs and high-interest savings accounts deposits are eligible for CDIC insurance, but that only covers up to a maximum of $100,000 (principal and interest combined) per depositor per insured category. Right now, every major bank in Canada is probably sending out a memo to its financial advisors: "Be very weary of Home Trust GICs, there could be a possible run on them." Poor guy is probably petrified of what's going to happen next with this company which secured a loan at onerous terms to "mitigate the effects" of Home Trust's dwindling high-interest savings accounts deposits. Is it a major Canadian pension fund through its private debt operations, a US private equity shark, or is it a major Canadian bank that is scared of contagion effects as a meltdown in Canada's subprime mortgage market can explode Canada's housing bubble and sink the economy into a debt deflation nightmare. Keep in mind a few of Canada's big bank CEOs have been sounding the alarm on Canada's housing bubble recently, pleading with the government to intervene. CIBC’s exposure to a real estate correction is highest among Canada’s banks but others are very worried too. Royal Bank of Canada is the latest Canadian firm to explore a sale of bonds backed by uninsured residential mortgages. The bank is testing investor interest in a deal that would bundle mortgage loans to borrowers with credit ratings just below prime, known as “alt-A” mortgages, according to Tim Wilson, chief financial officer of Equitable Group Inc., one of the lenders which is originating the loans being bundled. Canadian banks are eager to package uninsured home loans into bonds after the federal government last year made it harder for lenders to get government guarantees on mortgages. Bank of Montreal is planning a residential MBS to securitize C$2 billion ($1.5 billion) of prime uninsured mortgages. National Bank of Canada is exploring investor interest in a deal that would be backed by MCAP Corp. “alt-A” mortgages. The RBC deal would be sponsored by Steel Curtain Capital Group LLC and Ashley Park Financial Services. It may also include mortgage loans from Home Capital Group Inc., according to people familiar with the matter, who asked not to be identified because the deal is private. Spokesmen for Toronto-based Royal Bank of Canada and Home Capital declined to comment. Representatives for Paradigm Quest Inc., a mortgage servicing company that is affiliated with Ashley Park, weren’t immediately able to comment. 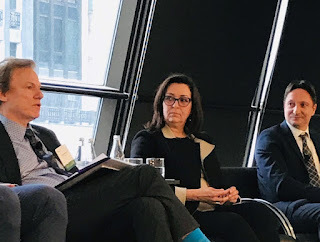 Steel Curtain Capital is exploring opportunities for creating a multi-lender residential mortgage securitization platform in Canada and is speaking to multiple lenders and third-party service providers, owner Frank Pallotta said by phone. He declined to comment on the deal being marketed by RBC. The prospective offering comes as Ontario announced measures Thursday aimed at cooling Toronto’s hot housing market, including a 15 percent tax that will apply to foreign buyers of residential properties containing one to six units in the greater Toronto area. Home prices in the city jumped a record 33 percent in March from the same month last year. Affordability in the city reached its worst level since 1990 at the end of 2016, according to a report from Royal Bank of Canada. Subprime borrowers are generally considered to be home-buyers with FICO scores below 620 and mortgages with a loan-to-value ratio above 80 percent. The credit scoring scale from Fair Isaac Corp. ranges from 300 to 850. It will be interesting to see how Canada's regulators respond to the big banks' foray into Canadian subprime mortgage debt and more importantly, who will be dumb enough to buy this debt given what happened in the US in 2008. I don't know, maybe Canada's big banks are so scared of what happens if Canada's housing bubble bursts that they're "exploring" ways to keep the subprime mortgage market alive for a few more years. But the meltdown of Home Capital Group is a warning to big banks, regulators and the CMHC, Canada's real estate mania has reached epic proportions and it threatens not only our economy but the entire financial system. 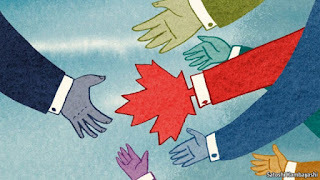 And truth be told, as Garth Turner notes in his latest comment, Where there's smoke..., this couldn't have come at a worse time with US policy shifting into protectionist mode against Canada. All this tells me to keep shorting the loonie, the Bank of Canada won't dare raise rates in this environment, and if things get even worse as the US economy slows (like oil prices collapsing below $30), we will see rate cuts and our own QE in Canada. Good times, eh? Below, Bloomberg's Allison McNeely reports on Home Capital's existential crisis. 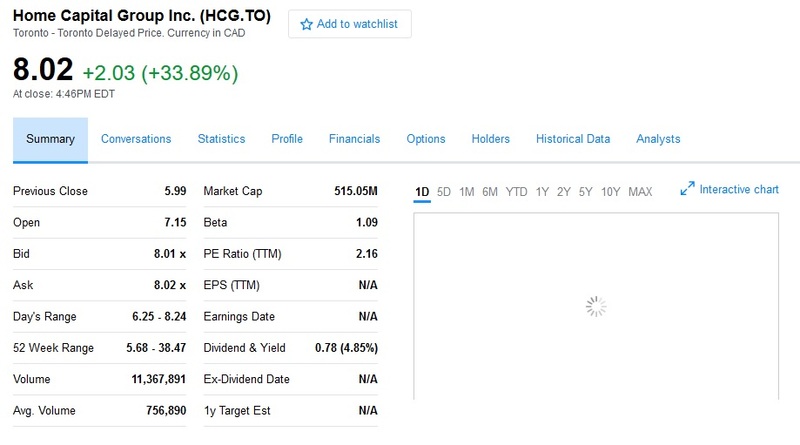 Also, on Thursday evening, Bloomberg's Scott Deveau and Allison McNeely report Home Capital Group hired bankers for a possible sale after the Canadian mortgage lender secured a C$2 billion ($1.5 billion) loan from Healthcare of Ontario Pension Plan to stem a run on deposits following a regulatory probe (see updates below). I also embedded another clip below with legendary short seller Marc Cohodes who has long been Home Capital's most vocal critic. He joins Bloomberg TV Canada's Lily Jamali to discuss what the embattled Home Capital Group needs to do to right the ship. I agree with him: "Jesus Christ couldn't right this ship." Lastly, for all you delusional Canucks who think real estate prices never go down, read Ted Carmichael's latest comment where he discusses Toronto's real estate boom, stating that while some say that house prices will never decline, the city's history clearly demonstrates that there is a good chance that, like its two predecessors, this boom will end badly. And if it does, we're all in trouble! Richard Leblanc, a law professor at York University, said the loan appears to represent a conflict for Keohane given his two roles. The article also states the Toronto-based lender hired RBC Capital Markets and BMO Capital Markets to advise on “strategic options”. Home Capital’s external spokesman Boyd Erman and representatives for HOOPP and Jim Keohane declined to comment. There are only two things I will say. Jim Keohane is one of the nicest, most honest pension fund managers I've ever come across. There is no way he didn't inform HOOPP's board of directors of his role prior to entering this transaction and I wouldn't be surprised if he vacated Home Capital's board after entering this deal (I'll put it to you this way, if it wasn't kosher, he would have been fired on the spot). I mention this because the idiots on Zero Hedge are posting dumb comments on that website calling Jim a crook and that's just pure nonsense. Bloomberg's reporters should also be more careful with what they publish because the optics look bad and they're contributing to this speculation. More importantly, if you look at the terms of the deal, they are extremely favorable to HOOPP -- ridiculously favorable -- so in the end, this is yet another great deal for HOOPP no matter what happens to Canada's housing market (with these onerous terms, you would need a severe correction of close to 70% in housing prices for HOOPP to lose money on this deal). The Healthcare of Ontario Pension Plan (HOOPP) today confirmed that it has agreed along with a syndicate of lenders to provide a secured line of credit in the amount of $2-billion dollars to Home Trust Company. Normally HOOPP’s policy is not to disclose information on our investments, however, given the amount of media speculation, we have decided to disclose this information today. Like any investment, this decision was made in the best interest of our members’ financial needs. We have a long history of providing these types of investments as appropriate, risk-balanced vehicles to meet our overall return targets. This investment followed all the appropriate due diligence. Enough said. 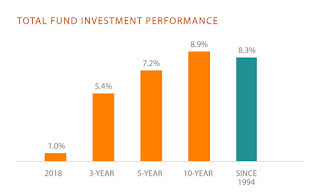 It's deals like this one where there is an asymmetric payoff which explains why HOOPP is one of the best pension plans in Canada and the world. Also worth noting in the press release that other investors were part of this deal, so HOOPP didn't go it alone. The head of an Ontario pension plan has stepped down as a director of Home Capital Group Inc. after his fund agreed to provide a $2 billion loan to help offset a run on deposits at the struggling Canadian mortgage lender. Healthcare of Ontario Pension Plan President and Chief Executive Officer Jim Keohane said he recused himself from the lending talks and stepped away from Home Capital’s board last Tuesday before formally resigning on Thursday. He also said that Kevin Smith, Home Capital’s chairman, has stepped down from HOOPP’s board. “I was not involved in any decision making on the other side of this at all,” he said. Home Capital didn’t identify the lender in separate statements Wednesday and Thursday, though people familiar with the process told Bloomberg News that the health-care workers pension is backing the loan. The Toronto-based lender said it hired RBC Capital Markets and BMO Capital Markets to advise on “strategic options” after it secured the one-year loan, according to the statement. HOOPP confirmed in a separate statement late Thursday that it has agreed, along with a syndicate of lenders, to provide the $2 billion credit line. “Normally HOOPP’s policy is not to disclose information on our investments, however, given the amount of media speculation, we have decided to disclose this information,” according to the statement. A Home Capital sale could be the next step for the mortgage lender, which faces allegations by Ontario’s securities regulator that it misled investors on disclosures about an internal investigation. Home Capital’s internal probe found 45 outside brokers falsified income information on mortgage applications. A sale becomes more likely if the firm can’t reverse a decline in its Guaranteed Investment Securities deposits, GMP Securities analyst Stephen Boland said earlier in a note. Home Capital shares fell 65 per cent Wednesday, after the lender said the terms of the loan will make it hard to meet financial targets. The stock rebounded Thursday, rising 34 per cent to $8.02 in Toronto. The stock traded as high as $56 less than three years ago. The credit line from the pension fund provides additional liquidity for Home Capital. HOOPP is a Toronto-based pension plan which represents more than 321,000 health-care workers in Ontario, with assets of about $70 billion. Home Capital’s external spokesman Boyd Erman declined to comment. The one-year credit line from HOOPP has a 10 per cent interest rate on outstanding balances and a 2.5 per cent rate on undrawn amounts. The finalized agreement follows an announcement early Wednesday that Home Capital had reached a non-binding agreement in principle with an institutional investor for the loan. Under the terms of the loan, Home Capital is required to make an initial C$1 billion draw and pay a non-refundable commitment fee of C$100 million. The loan is secured by a pool of mortgages originated by Home Trust, the company’s mortgage origination subsidiary. S&P Global Ratings downgraded Home Capital Thursday to junk with a B+ rating, from BBB-, the lowest level of investment grade. The senior unsecured rating on Home Trust was lowered to BB from BBB. DBRS Ltd. downgraded Home Capital to BB from BBB (low) and placed all ratings under review with negative implications on April 26. Boland said estimates on a sale price for Home Capital would be speculative, but said commercial banks may be interested. Home Capital’s market value has plunged to C$515 million, from about C$3.5 billion in 2014. Meanwhile, short-sellers are betting against Home Capital and rival mortgage lender Equitable Group Inc., with short interest positions surging since mid April. Shares of the two firms are the most shorted among Canadian financial companies, with investors having short interest in more than 56 per cent of the shares available to the public, according to data compiled by Markit. Genworth MI Canada Inc., a mortgage insurer, also has about 31 per cent of its stock shorted, the data show. Like I said, even though there could be more upside from these levels, I wouldn't touch shares of Home Capital but it's clear that HOOPP and other lenders entered a great deal. It's also clear that Jim Keohane did the right thing by recusing himself during negotiations and then resigning from Home Capital's board after the deal was made and put his members' best interests first. Update: See subsequent comment of mine, Canada's Pensions to the Rescue? 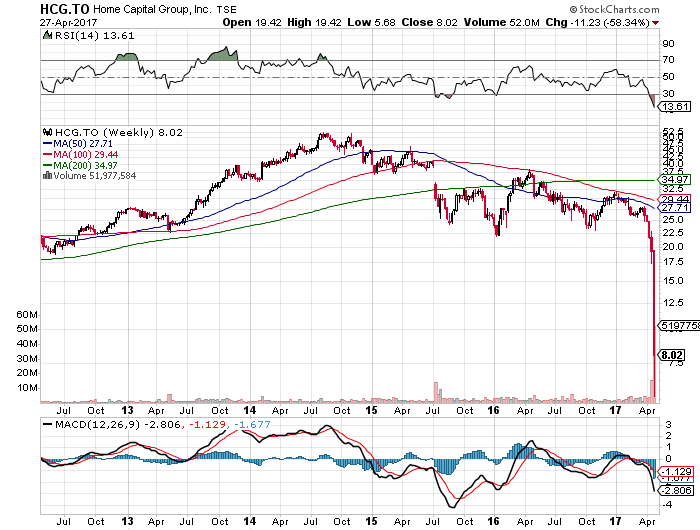 As of 20 June, 2017, shares of Home Capital Group (HCG.TO) more than doubled since hitting their lows. The company announced that its subsidiary, Home Trust Company, has entered into a definitive agreement with KingSett Capital to sell a portfolio of commercial mortgage assets valued at approximately $1.2 billion. This transaction helps stabilize Home Capital's liquidity position as the expected to enhance liquidity and reduce the amount drawn under the Company's $2 billion credit facility. A Goldilocks Situation For Stocks? New York City's Private Equity Woes? Be Very Afraid of These Markets? Are State Pensions Failing to Deliver? Is The Next Economic Shoe Dropping? 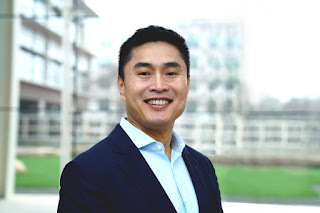 OPTrust Launches People for Pensions? Is The Reflation Trade Doomed? Big Departures From Pension Land? OMERS Bets on Data Analytics and Water?